This is a copy of an article in Journal of Social and Ecological Boundaries 1(2):81-105, 2005. Please cite as: Shutt, J. Eagle, and Mathieu Deflem. 2005. "Whose Face at the Border? Homeland Security and Border Policing Since 9/11." 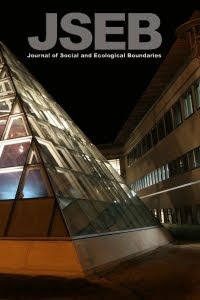 Journal of Social and Ecological Boundaries 1(2):81-105. —U.S. Customs and Border Protection website. This paper analyzes federal law enforcement efforts in matters of border security and counter-terrorism that have been implemented in the United States since the events of September 11. This analysis is specifically centered on the objectives, structure, and strategies of the Department of Homeland Security and the border security measures that have been taken since the formation of the Department. Special consideration goes to the security agencies that are involved with maritime safety, transportation security, and enforcement measures surrounding immigration. We show that now and in the foreseeable future, when the level of globalization affecting many nations across the world is at a level that is unprecedented in scale, the security borders of the United States are strengthened and expanded like never before. This article concludes with some implications for our thinking about the contemporary reality and meaning of borders and border security in the context of global strategies of counter-terrorism and policing. In the immediate aftermath of the September 11 terrorist attacks, the U.S. government undertook a comprehensive and costly restructuring of counter-terrorism and related security and policing efforts. Less than one month after 9/11, on October 8, 2001, President Bush issued an executive order creating a new cabinet position within the executive branch, the Director of Homeland Security, to which Bush appointed former governor of Pennsylvania Tom Ridge. U.S. Congress moved swiftly to back the President and supported the reshaping of the Office of Homeland Security into a full-fledged Department. After initial debates in January 2002, Congress passed the Homeland Security Act on November 25, 2002, creating the Department of Homeland Security (DHS). Tom Ridge served as Homeland Security Secretary until February 15, 2005, when former federal prosecutor Michael Chertoff was sworn in as the Department’s second Secretary. The Department comprises some 180,000 employees and melds over thirty federal agencies. On October 1, 2003, when President Bush signed the new Homeland Security Appropriations Bill, the DHS budget for fiscal year 2004 was $37.6 billion (The White House Press Secretary, 2003). The primary objective of the Department of Homeland Security is to protect the United States from future terrorist attacks. Seeking to accomplish this objective poses a multitude of logistical and other problems. Characteristics of U.S. geography and its political culture protecting individual liberties provide avenues that terrorist groups may also benefit from. Under these circumstances it becomes important to develop strategies to defend a vast, heavily populated, and loosely regulated nation without losing sight of important issues of civil and human rights. This paper addresses DHS efforts to solve such problems, considering specifically the Department’s history, aims, structure, and border security strategies. Because the focus of this paper is primarily oriented at the policing dimensions of homeland security, we place special emphasis on the structure and activities of the Border and Transportation Security directorate within DHS and its primary security agencies, U.S. Immigration and Customs Enforcement and the Transportation Security Administration. Centering on enforcement matters surrounding borders and border security, we analyze special problems associated with maritime and transportation security as well as enforcement measures with respect to immigration. Situated in contemporary discussions on the policing dimensions of counter-terrorism, our analysis reveals a remarkable strengthening and expanding of the security borders of the United States that will impact immigration for a considerable time to come. International terrorism is not a new phenomenon, but its proliferation over the past decades has affected a multitude of countries across the globe, posing challenges to security and law enforcement at the local, federal, and international level more urgently than ever before (Deflem, 2004a; Deflem & Maybin, 2005). Focusing on the global dimensions of these developments in matters of policing, a distinction can be made between processes that supranationally affect police across nations, transnational police operations in foreign jurisdictions, and international cooperation efforts among police (Deflem, 2002). Border policing takes a peculiar place in this constellation, because it is affected supranationally by developments that increase or decrease the penetrability of borders, while also involving transnational activities oriented across national borders as well as forms of cooperation among agencies of various nations. Under conditions of increased globalization, it becomes critical to estimate the impact of the internationalization of policing and the internationalization of crimes such as terrorism on the relation between international and traditional national police duties within jurisdictional borders, including border-related enforcement activities. Focusing on border security measures since the events of September 11, we rely on the theoretical insight that globalization phenomena have strongly differential effects on nations and localities (Deflem, 2002, 2004b). A variety of policing activities, ranging from unilaterally instigated transnational operations to cooperative international structures and border controls, reaffirm national states as well as their institutions as the central units of analysis, thus heightening rather than diminishing the importance of borders (Marx, 1997). In the case of border policing, as this analysis will show, the internal and external dimensions of policing also exist side by side as complementary components of the state’s monopoly of force. This perspective conforms to the viewpoint that although police institutions are affected by globalization developments, they remain primarily involved with (intra-)nationally defined objectives. Our analysis of border policing tasks associated with the Department of Homeland Security will affirm this important persistence of nationality in the case of border controls, which also critically impacts the control of immigrants. Formal U.S. policies against terrorism developed very slowly during the 1970s and 1980s, and were mostly restricted to various departments in the executive branch. In the 1980s and 1990s, however, counter-terrorism policies expanded rapidly, although these developments could not have predicted the impact of the events of September 11. From an organizational viewpoint, most counter-terrorist measures before 9/11 had been implemented by a large number of weakly connected bureaucratic agencies, characterized by little or no coordination. The primary objective of any new agency or department that would be established after 9/11 minimally had to involve a proper coordination of these bureaucracies. Following the World Trade Center bombing in 1993, intelligence experts already predicted that terrorism would be a “continuing, intractable, and deadly threat” (Strickland and Willard, 2002, p.2). Yet, it took the catastrophe of September 11 to prompt fundamental changes to the Unites States’ counter-terrorism policy. The Al Qaeda master-minded attacks revealed that the information-sharing networks among U.S. counter-terrorism agencies were not sufficiently developed and that relevant policies were fragmented and unfocused (RAND, 2001). Before 9/11, counter-terrorism programs in the United States were composed of a series of loosely aligned agencies which had disparate policies and shared little information. The basic principle of U.S. counter-terrorism followed the so-called ‘lead agency’ paradigm, whereby the responsibility for different aspects of counter-terrorism was spread among different federal agencies “according to the closeness of fit to that agency’s traditional area of responsibility” (Cmar, 2002, p.457). This policy led to a multi-headed hydra, with counter-terrorism responsibilities dispersed among some 100 governmental entities. The FBI, for example, was under Presidential Decision Directive 39 (The White House 1995), the lead agency for crisis management, but the Federal Emergency Management Agency (FEMA) was responsible for consequence management. And while the Department of Justice was responsible for coordinating counter-terrorism strategies, it could not force other agencies to adopt those strategies, nor could it provide necessary funding to implement those strategies. Likewise, the Justice Department’s primary emphasis was on reactive law enforcement and prosecution, an approach which may have hindered its ability to preventively detect covert terrorist operations. 1) The Advisory Panel to Assess Domestic Response Capabilities for Terrorism Involving Weapons of Mass Destruction (the Gilmore Commission). In April 1999, U.S. Congress ordered a study by a panel at RAND, headed by Virginia governor James Gilmore. The Commission’s December 1999 report criticized the current state of counter-terrorism strategy, noting that governmental information-sharing was inadequate, and that the complex structure of the federal government impeded the flow of counter-terrorism intelligence to all governmental levels (RAND, 1999). Among the suggested policy reforms, the Commission called for a coherent and unified national counter-terrorism strategy, as well as the establishment of a nationwide counter-terrorism information clearinghouse. In its second report (RAND, 2000), the Commission argued for the establishment of a ‘National Office to Combat Terrorism’ in the President’s office. The Commission also urged a re-organization of counter-terrorism functions to “strengthen functional capabilities across all levels of government for intelligence collection and information sharing” (RAND, 2000, p.5). 2) The United States Commission on National Security/21st Century (the Hart-Rudman Commission). In 1998, a Defense Department-chartered commission on national security was formed under the bipartisan co-chairship of Senators Gary Hart, D-Colorado, and Warren Rudman, R-New Hampshire. In a January 2001 report, the commission recommended, amongst other things, the creation of a new federal structure in the White House in the form of a ‘National Homeland Security Agency’ to plan and coordinate various U.S. activities involved with homeland security. Such a new agency was judged indispensable, because a “direct attack against American citizens on American soil is likely over the next quarter century” (Costa, 2001, p.64). 3) The National Commission on Terrorism (the Bremer Commission). This commission, chaired by ambassador Paul Bremer, undertook a Congressionally mandated evaluation of the U.S. laws, policies, and practices concerning terrorism. After a thorough review, the Commission drafted a proposal, ‘Countering the Changing Threat of International Terrorism,’ in June 2000, which stated that significant aspects of counter-terrorism policy implementation were seriously deficient. The Commission did not propose a new super-agency, but instead suggested that U.S. intelligence and law enforcement communities should be able to use the full scope of their authority to collect intelligence regarding terrorism. Despite some differences, the Gilmore and Hart-Rudman commissions agreed upon the creation of a new national homeland security office, whether housed in a new agency or established as a White House office, that was to have a strong focus on border security. In the immediate aftermath of 9/11, many of the Gilmore and Hart-Rudman Commission’s recommendations were swiftly implemented with the creation of the Office of Homeland Security and its reformation into a new Department. The Department of Homeland Security is entrusted with responsibilities that explicitly relate to terrorism, including prevention against and recovery after terrorist attacks as well as monitoring of possible connections with illegal drug trafficking, while also seeking to ensure that the economic security of the United States is not diminished. Unification and coordination of U.S. counter-terrorism strategies and agencies was the key motive in the creation of the Department. DHS was set up to “transform and realign the current confusing patchwork of government activities into a single department” (DHS website, DHS Organization). The new super-entity brought together some 30 agencies, including both existing entities that were re-aligned from other government departments as well as newly formed agencies. In terms of organizational structure, DHS is composed of five directorates: Border & Transportation Security; Emergency Preparedness and Response; Science & Technology; Information Analysis and Infrastructure Protection; and Management. The directorates are supplemented by separate divisions which report directly to the Secretary of Homeland Security. These supplementary divisions include the U.S. Coast Guard, the U.S. Secret Service, the United States Citizenship & Immigration Services (USCIS), as well as the offices of State and Local Government Coordination, Private Sector Liaison, and Inspector General. Several DHS components are transfers and consolidations of existing agencies. For example, on March 1, 2003, the Immigration and Naturalization Service (INS) ceased to exist, and its responsibilities were transferred from the Department of Justice to three agencies within DHS: 1) US Customs and Immigration Services (USCIS), which is responsible for administering visas and immigration benefits; 2) US Immigrations and Customs Enforcement (ICE), in charge of enforcement issues related to immigration; and 3) Customs and Border Protection (CBP), responsible for border and immigration inspections as well as maintaining the security of ports of entry (Cerda, 2004). Within the Department of Homeland Security, the Border & Transportation Security (BTS) directorate is most important in matters of border policing. Responsible for maintaining the security of the United States borders and transportation systems, BTS is the largest DHS directorate and incorporates many important security agencies, such as the Transportation Security Administration (formerly in the Department of Transportation), U.S. Immigration and Customs Enforcement (the border security branch of the former Immigration and Naturalization Service), Customs and Border Protection (formerly the U.S. Customs Service in the Treasury), and the Office for Domestic Preparedness (from the Justice Department) (DHS website, Homeland Security Organization II, 2003). The Border & Transportation Security directorate oversees several programs and functions that involve an expansion and strengthening of border controls and a tighter supervision of immigration. The US-VISIT Program Management Office, for example, is responsible for the day-to-day activities and operations of the US-VISIT (United States Visitor and Immigrant Status Indicator Technology) program that grew out of the Illegal Immigration Reform and Immigrant Responsibility Act, which U.S. Congress had already passed in 1996 (McIntosh, 2004). The ACT required the then INS to create a tracking program for visitors to the United States and the creation of a national database of all foreign visitors. Since its inception in Homeland Security, US-VISIT requires visitors to provide biometric information upon entry into and departure from the United States. The system also begins processing immigration information as soon as a foreign national applies for a visa at an overseas embassy or consulate, and continues to maintain information on that individual when he or she enters the country at a port of entry, requests benefits such as change of status or adjustment of status, or departs from the United States. The US-VISIT system that is presently still developing and expanding. In January 2004, US-VISIT procedures were operational at 115 airports and 14 seaports, while pilot testing biometric exit procedures had begun at one airport and one seaport. In September 2004, these procedures expanded to include visitors who arrive in the United States via airports and seaports under the visa waiver program. U.S. Immigration and Customs Enforcement (ICE), initially called the Bureau of Immigration and Customs Enforcement, was set up to bring a unified and coordinated focus to the enforcement of federal immigration laws, customs laws, and, since November 2003, air security laws (ICE homepage). As the largest investigative arm within the Border and Transportation Security Directorate, ICE is composed of various specialized Divisions with a multitude of functions. Among the ICE Divisions, the Office of Investigations is responsible for investigating human smuggling, narcotics, weapons and other contraband smuggling, illegal arms exports, financial crimes, cyber crimes, as well as immigration crimes and human rights violations. The Office of Detention and Removal is in charge of the departure from the United States of illegal aliens. The Office of Air and Marine Operations is responsible for the enforcement of smuggling and terrorist activities by sea or air. The Office of Federal Protective Service detects and removes threats posed against the more than 8,800 Federal facilities that exist nationwide. Also in ICE, the Office of Intelligence is separately responsible for the collection, analysis, and dissemination of intelligence data. And, finally, the Federal Air Marshal Service is brought under ICE since November, 2003 to police hostile acts targeting U.S. air carries, airports, passengers, and crews. Bringing together some 20,000 employees in its various Divisions, ICE has clearly become one of the most important federal law enforcement agencies since the Federal Bureau of Investigation. Though still not widely known and discussed in the media and among scholars, ICE has been involved in a plethora of activities. In March of 2005 alone, ICE reported a multitude of varied activities, such as the apprehension of illegal workers at National Defense subcontracting companies, the deportation of dozens of foreign criminals and hundreds of illegal aliens, various arrests of alien fugitives, the removal of hundreds of criminal aliens and immigration status violators, multiple arrests of drug smugglers and of gang members, the return of money to victims of telemarketing scams, and the $11 million settlement to which the Wal-Mart company agreed as a result of an ICE investigation into the hiring of illegal aliens. The BTS Directorate is also responsible for securing U.S. transportation systems. The Transportation Security Administration (TSA) in BTS has responsibility for security at US airports. Unlike ICE, the TSA is very well known among the general public, largely because of its screening functions of airline passengers. But also unlike ICE, TSA has only minimal security functions and enforcement powers in overseeing the Arming Pilots Against Terrorism Act. Passed as part of the Homeland Security Act of 2002, the Act requires TSA to supervise volunteer pilots of air carriers for the purpose of defending the flight decks of passenger aircraft against acts of criminal violence and air piracy. Securing the borders of the United States is no easy task. The United States has 5,525 miles of land border with Canada and 1,989 miles with Mexico. The U.S. maritime border includes 95,000 miles of shoreline, and a 3.4 million square mile exclusive economic zone. Each year, more than 500 million people cross the borders into the United States, some 330 million of whom are non-citizens. Policing maritime and transportation venues creates daunting logistical problems. For example, the U.S. receives some fifty-one thousand port calls each year, but law enforcement can inspect only two percent of containers entering the country at a time expense of two hours per container (Mellor, 2002). Securing the U.S. borders and transportation systems, the Office of Air and Marine Operation and the U.S. Coast Guard play a leading role. Located within ICE, the mission of the Office of Air and Marine Operations (AMO) is to deter and investigate acts of terrorism and smuggling arising from unlawful movement of people and goods across the borders of the United States. Dating back to the 1970s, the Air and Marine Interdiction Division was created in 1999, and was thereafter transferred to the Department of Homeland Security. Next to safety issues, AMO has operational responsibilities related to aviation and marine regulations, including liaisons with other law enforcement and aviation agencies and with agencies involved in anti-terrorism and drug interdiction. Originally established to combat drug smuggling, AMO has taken on counter-terrorism functions, for instance by overseeing the Air and Marine Operations Center in Riverside, California. The Center provides 24-hour radar surveillance throughout the continental United States, Puerto Rico, the Caribbean and beyond. The Center allows AMO to identify, track, and support the interdiction and apprehension of people attempting to enter U.S. airspace with illegal drugs or terrorist objectives. The United States Coast Guard is a military and multi-mission maritime service. In times of peace, it operates as part of the Department of Homeland Security, serving as the nation’s front-line agency for enforcing U.S. laws at sea and protecting our coastline and ports. In times of war or on direction of the President, the Coast Guard serves under the Navy Department. The Coast Guard missions include various non-security tasks, such as the protection of natural resources, but also comprises homeland security objectives. Among these objectives are the protection of ports and marine transportation systems from terrorism, illegal drugs, illegal aliens, firearms, and weapons of mass destruction. Prior to the events of September 11, 2001, counter-terrorism responsibilities were amorphously divided among many departments and agencies at various levels of government. Among the inefficiencies of this structure, each department or agency that had counter-terrorism objectives had responsibility only within its specific sphere of competence, but not beyond. Cooperation with other agencies was not well organized, and there was little structural impetus for information-sharing and coordination of activities. Seeking to bring about appropriate inter-agency coordination, the Homeland Security Act made the duties of many individual agencies more explicit. For example, the BTS directorate, with over 100,000 employees, has responsibility for securing the nation’s borders and guarding its infrastructure (DHS website, DHS Organization, Border & Transportation Security). While ICE within the Directorate maintains lists of most wanted criminal aliens and fugitives, DHS agencies are not responsible for investigating and prosecuting terrorist attacks, for such duties remain the responsibility of local, state, and federal enforcement agencies. In this sense, Homeland Security involves a consolidation of enforcement powers in the form of a horizontal structure of cooperation and harmonization among various specialized agencies. The emphasis in this process of coordination, however, is on the structure of the various organizations situated within homeland security and not on the actual mechanisms of cooperation between them. As such, the officials working for various DHS agencies know where they stand and how they relate to each other, but much less about how they should interact with one another. Importantly, the coordination of homeland security functions since the creation of DHS has also brought about a centralization of authority in a vertical structure between federal security agencies and the executive branch. The formation of DHS has in effect also consolidated and extended executive powers, at least inasmuch as the Department has been responsive to Presidential policy. Certain Presidential orders have indeed been implemented by DHS. Most famously, DHS created a Homeland Security Advisory System, a series of terrorist-risk-level warnings, in response to a Presidential directive that mandated the creation of “a comprehensive and effective means to disseminate information regarding the risk of terrorist acts to Federal, State, and local authorities and to the American people” (The White House Press Secretary, 2002). The one principal theme that guided the creation of DHS was and is unification. Before the creation of DHS, coordination was at times sorely lacking. For example, as many as three different border inspectors oversaw immigration and the importation of goods: an Immigration inspector, a Customs inspector, and an Agriculture inspector (DHS website, Homeland Security Press Secretary, September 2003). On March 1, 2003, then DHS Director Tom Ridge merged these three inspectorates into the Customs and Border Protection directorate (CBP), a unified agency of 18,000 inspectors. CBP has been most involved in developing a streamlined border security policy to present ‘one face at the border (One Face at the Border, 2003). The creation of the Department of Homeland Security also worked to increase functional specialization in various matters related to counter-terrorism. Immigration matters, for example, are now more clearly divided in terms of the administrative services that are involved, on the one hand, and enforcement matters, on the other. In charge of all service matters relating to immigration is the US Citizenship and Immigration Service. And with respect to enforcement, Customs and Border Protection is in charge of border patrol and inspections, while Immigration and Customs Enforcement is focused on the interior investigations aspects of immigration and the detention and removal aspects of immigration. Finally, DHS also developed organizations specifically to ensure a flow of ideas to and from the Department and state and local agencies and individuals. To facilitate cooperation between Homeland Security and state and local governments, academia, and private sectors, DHS initiated the Homeland Security Advisory Council. The Council provides to DHS security recommendations, such as advice on how to implement a comprehensive national counter-terrorism strategy. Additionally, DHS established the Office of State and Local Government Coordination and the Office of Private Sector Liaison to ensure coordination with DHS. The massive reorganization of the security functions and agencies involved with counter-terrorism and border policing since the formation of the Department of Homeland Security raises a number of issues that are important for our thinking about borders, border security, and the movement of goods and people across national borders. Among these issues, the cross-border flow of goods and people impact law enforcement aspects of containerization and immigration, while air traffic and the heavy reliance in security policies on technological advances raise additional concerns. Under international law, any port state has the power to board and inspect vessels using its ports (Firestone & Corbett, 2003). Each year, more than 200 million sea-cargo containers move through the world’s seaports, and such containers account for nearly 90% of all worldwide trade (Container Security Initiative, 2003; DHS, CSI in Brief, 2003). Nearly 50% of all U.S. imports arrive by container. Containerization creates a security vulnerability. It is virtually impossible to account for each and every container’s contents. Searching a container can take many hours, making the inspection of every container practically unfeasible. Inspections are not only economically inefficient, but they may invade individual liberties (Iraola, 2003). On the same day when President Bush signed the Homeland Security Act, he also signed the Maritime Transportation Security Act of 2002, which called for the assessment of port security vulnerabilities and the establishment of a nationwide port security plan. Port inspections are entrusted to Customs and Border Protection. In January 2002, CBP implemented the Container Security Initiative (CSI) to prevent containerized cargo from being exploited by terrorists. The basic principle of this initiative is to begin terrorism detection at foreign ports. The key objectives are to: “(1) Establish security criteria for identifying high-risk containers based on advance information; (2) Pre-screen containers at the earliest possible point; (3) Use technology to quickly pre-screen high-risk containers; (4) Develop secure and ‘smart’ containers” (DHS website, CSI in Brief, 2003). The initial implementation of the Container Security Initiative required the cooperation of foreign governments. CBP identified the top 20 foreign ports, which ship approximately two-thirds of the United States’ container volume, and secured agreements for pre-inspection of outgoing containers. Reciprocally, inspectors of cooperating nations have been welcomed to U.S. ports to conduct inspections. For example, Japanese customs personnel are currently stationed in Los Angeles, and Canadian customs officials are present in Newark and Seattle (DHS website, CSI in Brief, 2003). CBP likewise agreed to bilaterally share information with cooperators. In a next phase, which is presently still ongoing, CSI inspections are expanded to additional ports. As part of the new Homeland Security Appropriations Bill approved on October 1, 2003, the President has made CSI the fulcrum for the development of new cargo-screening technologies, which could speed the passage of containers while improving security. Immigration became a central counter-terrorism focal point after 9/11, especially when the immigration status of the suicide hijackers became widely known. All 19 hijackers had legally entered the country with properly issued visas (Strickland & Willard, 2002). The key difficulty that immigration officials face is discerning legitimate immigrants and visitors from would-be terrorists. The detection problem is complicated by those organized terrorist organizations, such as al Qaeda, that may take advantage of immigration loopholes (e.g., via student visas) or resort to the illegal procurement or falsification of identification records. Prior to 9/11, visa issuances were primarily administered by the State Department acting through its embassies and consular authorities. Under the new structure, DHS is solely responsible for the administration of visas, although cooperation plans among USCIS, CBP, ICE, and the State Department are still developing (Doane, 2003). The Enhanced Border Security and Visa Reform Act of 2002 legislated sweeping changes in immigration record-keeping (Salter, 2004). The Act called for enhanced review of visa applicants by the Secretary of State. Intelligence and law enforcement information were ordered to share information relevant to the admissibility and deportation of aliens with USCIS. The Act also called for the establishment of a plan for law-enforcement agencies to provide DHS and USCIS regularly with information. This plan would be coordinated by the President under a specific timetable and would include the establishment of a biometric standard for immigration. USCIS was ordered to create a unified immigration database, called Chimera, which would be available online to all USCIS and CBP officers. The database would contain, in standardized format, entry and exit times as well as biometric identification. Information would be current and immediately available, and the problem of fragmented record-keeping could be overcome. Moreover, to prevent document falsification, proprietary machine-readable formats were to be implemented, along with biometric identifiers, by October 2004 (Strickland & Willard, 2002). The Visa Reform Act also called for enhanced monitoring of foreign students and the tracking of lost passports. Consequently, ICE instituted the Student and Exchange Visitor Information System (SEVIS), which went into effect August 2003. Essentially a tracking system, SEVIS is “an automated process to collect, maintain, and manage information about international foreign students and exchange visitors during their stay in the United States” (ICE website). Educational institutions must comply with SEVIS if they are to accept foreign students. SEVIS shifts some of the law enforcement burden to educational institutions. For example, schools must inform ICE if a student fails to enroll or fails to carry a full class load. From the viewpoint of controlling migration, the borders of Canada and Mexico pose a peculiar logistical problem for DHS, especially since the land borders have been increasingly conceived by lawmakers and enforcement officials as posing a special terrorism risk (Bowers, 2005). The Enhanced Border Security and Visa Reform Act calls for increased international cooperation in immigration information, specifically for DHS and USCIS to develop a plan for working with Canada, Mexico, and visa-waiver-program countries in order to develop a unified, international network of interoperable databases. Relatedly, US-VISIT has been initiated to utilize biometric standards to identify foreign national visa applicants. Under this program, visa admission responsibility is shared by the Department of State, DHS, and federal, state, and local law enforcement. If an individual overstays the visa or DHS develops information that that individual represents a threat, DHS will release a violator watch list to defense, federal, state, and local law enforcement, who will apprehend suspected violators (Strickland & Willard, 2002). Finally, providing an information basis to relevant DHS operations is the Inter-agency Border Inspection System (IBIS), a database that is available to both the Departments of Homeland Security and Justice. If either Department receives a tip-off of an immigration violation, a visa revocation or denial code is entered directly into the IBIS system, allowing the immediate distribution of that information. If a National Crime Information Center (NCIC) alert is issued, that alert automatically goes into IBIS as well. Consular databases have been consolidated and they, too, are attached to IBIS. Airline security was perhaps the most visible lapse in pre-9/11 security, as terrorists managed to smuggle homemade weapons onboard several planes and access the cockpits. Preventing the importation of weapons and explosives on airplanes has become a key objective in present-day counter-terrorism. U.S. Congress has taken specific measures to aid DHS in its related security measures. Under the Aviation Transportation Security Act, enacted November 2001, every passenger bag must be screened in a complex multi-layered system, using explosives detection equipment and manual searches (Department of Transportation News Release, 2002). In April 2003, Congress authorized billions specifically for airline security efforts (DHS website, Homeland Security Press Secretary, April 2003). These appropriations included $665 million for applying security enhancements to existing airports, $2.4 billion for airliner security, and $100 million for the strengthening of flight-deck doors. Since November 2003, ICE has responsibility for enforcing air security laws in addition to its responsibilities for enforcement of immigration and customs laws (ICE I, 2003). Continuing the theme of consolidation and reorganization, in September 2003, then Secretary Ridge consolidated the Federal Air Marshall Service with ICE (DHS website, Homeland Security Press Secretary, September 2003). The move was characterized as an increase in unity among related enforcement efforts. Currently, federal law requires that passenger and crew manifests for inbound and outbound commercial air and sea carriers be electronically transferred to the Advance Passenger Information System (APIS). This system is a database capable of performing searches on passengers and crewmembers prior to their arrival to or departure from the United States. APIS is maintained and utilized by CBP, but is also linked to a large network of databases, including the Interagency Border Inspection System, which includes data from CBP and twenty-one other federal agencies (APIS Fact Sheet, 2003). Names appearing in the database are also checked against the FBI’s National Crime Information Center wanted persons database. In the implementation of various counter-terrorism efforts, DHS has placed a premium on advanced technologies, corresponding to similar developments in other areas of law enforcement and counter-terrorism (Ventura, Miller, and Deflem, 2005). Technologically advanced methods include scanning for biological and nuclear weapons or explosives as well as maritime security technologies relating to terminal security, vessel tracking, and cargo integrity (TSA Technologies, 2003). Additionally, DHS is attempting to spread anti-terrorism programs to state and local governments through a series of anti-terrorism preparedness grants. Legal issues of product liability might discourage technological innovations. For example, legal liability might dissuade private airline industry from developing and deploying anti-missile technologies, because any failure of the technology might lead to lawsuits against the airline companies. To counter product liability disincentives, lawmakers included an additional act, Supporting Anti-Terrorism by Fostering Effective Technologies Act of 2002 (the SAFETY Act), within the Homeland Security Act. Under the SAFETY Act, companies that develop innovative anti-terrorism technologies are shielded from liability. DHS is in charge of specifying appropriate regulations to check that a company’s anti-terrorism technology meets various criteria and is safe for use as intended. The consequences of September 11 can be expected to remain with us for a long time to come. The most massive overhaul of the structure of U.S. government since World War II, the creation of the Department of Homeland presents a unprecedented episode in the constellation and transformation of security, counter-terrorism, and law enforcement. Since 2002, DHS and its various agencies are still continually being reorganized and consolidated. While unification and harmonization were the central objectives when the Department was created, numerous broken chains remain among the various agencies. Related security agencies, notably the FBI and the CIA, remain outside the structure of Homeland Security. Nonetheless, there is a trend towards coordination at an organizational and informational level. The recent creation of the new position of Director of National Intelligence also fits in these coordination plans. The future of counter-terrorism and border security thus hovers between the ineffectiveness of an organizational wilderness of multiple agencies, on the one hand, and the potentially Orwellian prospects of a smooth and well-coordinated super-agency, on the other. Police measures associated with securing the borders of states are intrinsically international in nature. Especially in this age of heightened concerns surrounding international terrorism, the international dimensions of security, border policing and counter-terrorism make any enforcement measures originating from the United States also relevant for other countries and their respective responses to similar problems surrounding terrorism, international crime, and migration. Thus, it is today true more than ever before that the very notion of homeland security also implicates the related efforts and strategies that are undertaken by foreign agencies and governments. Security, migration policies, counter-terrorism, and crime control are globalized. Most remarkable in this respect is the finding from research that many of these measures are planned in relative isolation from one another and that they lack a well-developed sense of coordination and harmonization, even when the agencies involved share very similar goals (Deflem 2004a; Deflem & Maybin 2005). Within the context of the persistent globalization of policing and security, many counter-terrorism functions, such as maritime security and migration control, are beyond the power of a single national state. If, as former Homeland Security Secretary Tom Ridge indicated, the international terrorism threat is permanent (Iraola, 2003), will the United States remain in a chronic state of alert and high security? Or are there alternatives? What has become very clear from recent experiences is that unilaterally conceived strategies can produce unintended consequences, inasmuch as the security and police forces of otherwise friendly nations may turn against their counterparts in the United States only because a more egalitarian cooperative spirit was missing. But unilateralism need not be the only possible answer. As Firestone and Corbett (2003, p.436) write, “rather than establishing ‘fortress America,’ the United States should look to the model of international environmental cooperation and advocate the globalization of security.” In other words, U.S. security, counter-terrorism and migration policies need to be developed on the basis of an explicit awareness that the world is highly interconnected. Rather than trying to build a security order exclusively modeled after the U.S. experience in security policy and law enforcement, a collaborative international model of cooperation could be construed that also takes into account the concerns of other nations. To some extent, a cooperative international model has been adopted by relevant U.S. security agencies. The Department of Homeland Security, for example, has taken steps to involve foreign countries in multilateral initiatives in implementing the Container Security Initiative. Mellor (2002, p. 387-390) suggests anti-terrorist regional conventions and the creation of joint multilateral and multinational policing forces as useful complements to such efforts. Civil-rights critics and policy analysts have noted the inherent risks involved in the creation of a huge federal agency to ensure internal security (Cmar, 2002). Without proper supervision, such an agency might take actions which are unconstitutional or otherwise limit individual freedoms, privacy, and rights that protect against illegal search and seizure. DHS actions, coupled with potentially invasive government policies such as the Patriot Act, may fuel public anxieties over these matters, which may further hamper counter-terrorist measures. Critics of the US-VISIT program, for example, have raised concerns with respect to the cost and technological shortcomings of the system, the loss of privacy, and the potential for racial profiling (McIntosh, 2004). From a migration viewpoint, profiling is more than a mere possibility, as the US-VISIT program relies on a categorical system that differentiates between various classes of nations depending on the risk they pose in terms of the known movements of terrorist organizations (Salter, 2004, pp. 77-78). The high-risk class includes nations such as Iran, Iraq, and Syria, while lower risks are attributed to visitors from Afghanistan, Lebanon, and Qatar, amongst others. Special attention under the US-VISIT program also goes to male visitors born before 1987 and those who have traveled to the United States on more than one occasion. Relatedly, there are concerns that border security and counter-terrorist strategies increasingly conflate the policing problems associated with refugees and the terrorist threat (Pickering, 2004). With the changes implemented in U.S. border controls since September 11 and the formation of the Department of Homeland Security, the borders subject to U.S. police efforts are not only more stringently controlled, the borders themselves have also expanded. September 11 has thus served as a catalyst to reinforce a process of social control which Stanley Cohen (1985) has referred to as the widening of the net and simultaneous thinning of the mesh of control. New security borders are conceived as additional spaces of policing, while the existing borders are policed more tightly than before. U.S. border controls have strengthened alongside the northern border while they have not weakened alongside the border with Mexico (Andreas, 2003; Deflem, 2001, 2004b). This added attention towards the border with Canada is accompanied by qualitative changes in existing systems of border controls as points of entry and paths of transportation into and within the United States are now controlled more tightly than before. A focus on border control should not be reduced to those efforts that deny access to clandestine visitors (Andreas, 2003), for that would overlook that all persons and goods crossing a national border are subject to control. That was also the case well before 9/11. Of course, the focus on a more technologically advanced and efficient system of control does not necessarily imply that the borders are controlled more effectively. One of the most striking central ironies of border control (as of many other security and police measures) is that they may have the greatest impact there where they are needed the least. In terms of border crossings, for example, innocent tourists entering the United States via commercial air flight will be subject to tighter controls than illegal aliens and potential terrorist suspects who enter the U.S. on foot via one of the clandestine routes at the border with Mexico or Canada. Research has likewise found that homeland security measures are not always consistently applied, with such bizarre consequences that not all members of one and the same family have been admitted to the country for the same time period (Meyers, 2005). Relatedly, it is clear that enforcement measures have been much better developed in terms of heightened controls to apprehend potential terrorists after they have already boarded planes or are otherwise en route to the United States. Much less developed —despite the many warnings from the intelligence and security community— is the capacity of human intelligence to track down terrorist groups and individuals abroad and undermine their terrorist planning efforts before they can hit the U.S. homeland (Deflem, 2005). Reviewing the impact of newly instituted measures to police the movement of goods and people across national borders, it is clear that the events of 9/11 have served as a major catalyst to expand and strengthen the United States borders. Visa applicants are controlled from the moment of application in their home countries, while illegal immigrants are more than ever subject to apprehension and removal. The control of points of entry and systems of transportation, in the air, by land, and by sea, is likewise tightened in view of the threat from international terrorism. Given the intensified focus on border security in view of a globally conceived threat, it is clear that globalization is not about breaking down barriers or borders, but about the reaffirmation and strengthening of borders because of an increasing interconnectedness across locales and the resulting penetrability of borders. A world society with a high degree of interconnectedness will have many borders that are to be policed. On the part of control agencies, the response is to increase border security efforts, not merely to deny access when such would be called for, but more generally to police each and everyone. Andreas, P. 2003. Redrawing the line: Borders and security in the twenty-first century. International Security, 28, 2, 78-111. Cerda, V.X. 2004. The new face of immigration in the Department of Homeland Security. St. John's Journal of Legal Commentary, 19, 1-7. Cmar, T. 2002. Office of Homeland Security. Harvard Journal on Legislation, 39, 455-474. Cohen, S. 1985. Visions of Social Control. London: Polity Press. Congressional Budget Office. 2002. Cost Estimate, H.R. 5005, Homeland Security Act of 2002. Washington, D.C.
Costello, F. 2002. The new federal approach to transportation: The first three months of the Transportation Security Act and the Transportation Security Administration. DePaul Business Law Journal, 14, 333-240. Deflem, M. 2001. International police cooperation in northern America: A review of practices, strategies, and goals in the United States, Mexico, and Canada. In D.J. Koenig, and D.K. Das, (eds), International police cooperation: A world perspective, pp. 71-98. Lanham, MD: Lexington. Deflem, M. 2002. Policing world society: Historical foundations of international police cooperation. Oxford; New York: Oxford University Press. Deflem, M. 2004a. Social control and the policing of terrorism: Foundations for a sociology of counter-terrorism. The American Sociologist, 35, 2, 75-92. Deflem, M. 2004b. The boundaries of international cooperation: Problems and prospects of U.S.-Mexican police relations. In M. Amir and S. Einstein, (eds), Police corruption: Challenges for developed countries - Comparative issues and commissions of inquiry, pp. 93-122. Huntsville, TX: Office of International Criminal Justice. Deflem, M. 2005. Better intelligence needed to fight terror attacks. Op-ed. The State, July 13, 2005, p. A10. Deflem, M., & L.C. Maybin. 2005. Interpol and the policing of international terrorism: Developments and dynamics since September 11. In L.L. Snowden, and B.C. Whitsel, (eds), Terrorism: Research, Readings, & Realities, pp. 175-191. Upper Saddle River, NJ: Pearson Prentice Hall. Enhanced Border Security and Visa Reform Act of 2002. H.R. 3525, Public Law 107-173. Firestone, J. & Corbett, J. 2003. Maritime transportation: A third way for port and environmental security. Widener Law Symposium Journal, 9, 419-437. Government Executive Magazine. 2001. The counter-terrorism bureaucracy. Government Executive Magazine, September 24, 2001. Available online: http://www.govexec.com/news/index.cfm?mode=report&articleid=21153. Homeland Security Act of 2002. November 25, 2002. H.R. 5005-8, Pub. L. 107-296. Maritime Transportation Security Act of 2002. November 25, 2002. S.1214, 107th Congress. Marx, G.T. 1997. The declining significance of traditional borders (and the appearance of new borders) in an age of high technology. In P. Drogue, (ed. ), Intelligent Environments, pp. 484-494. Amsterdam: Elsevier Science. McIntosh, Sarah. 2004. Department of Homeland Security begins to implement new US-VISIT Program. Georgetown Immigration Law Journal, 18, 433-435. Mellor, J.S.C. 2002. Missing the boat: The legal and practical problems of the prevention of maritime terrorism. American University International Law Review, 18, 341-397. Pickering, S. 2004. Border terror: Policing, forced migration and terrorism. Peace & Security 16, 3, 211-226. Salter, M.B. 2004. Passports, mobility, and security: How smart can the border be? International Studies Perspectives, 5, 1, 71-91. Ventura, H.E., Miller, J.M., & Deflem, M. 2005. Governmentality and the war on terror: FBI project Carnivore and the diffusion of disciplinary power. Critical Criminology, 13, 1, 55-70.